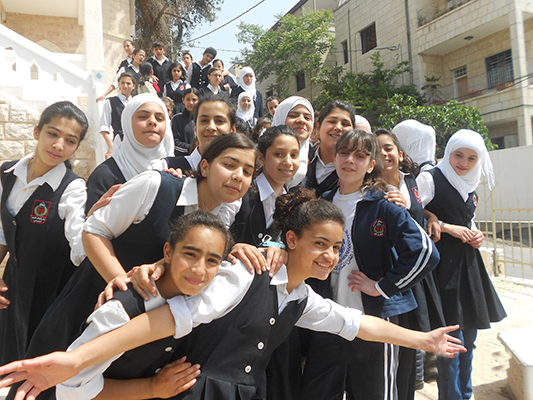 Dar Al-Tifel Al-Arabi School was founded in the year 1948 by the late Ms. Hind Al-Husseini. Since then, Ms. Hind offered her own home as a shelter and as a school for the children of the Palestinian martyrs of Deir Yassin massacre. The school started with 55 children of different ages and academic levels, with severely bad financial conditions in addition to being social cases. Through time it expanded, developed and got independent and its diverse sections were merged in one big building to become recently one of the most outstanding and famous schools in the city of Jerusalem. The school comprises the nursery and the Kindergarten in addition to the elementarty and secondary stages. In addition to the classrooms the school has many annexes that are necessary in enhancing the educational process. It has a social service section that provides psychological care and support for its students. Moreover, it arouses their awareness about educational and mental health topics through scheduled lectures. The physical health of our students is very important, that’s why there is the school clinic run by the Palestinian Health Committees. The clinic is responsible for providing the students with any medical care needed in addition to presenting medical workshops and health guidance seminars. The school cares to provide its students with the knowledge needed to support their subject matters and researches by going to the school libraries that include all the references needed as encyclopedias, books, periodicals, video films and educational games. The Palestinian identity and heritage are very important to all Palestinians and deserve to be studied and preserved. This is the role of the workshops of DTA Museum by guiding the students to participate in the museum’s folkloric and art workshops. On the other hand, the school exerts much effort to develop and invest the students’ abilities and talents as in sports, music and art, in addition to teaching them to master some specific skills as computer skills, scientific experiments, cooking and etiquette. DTA School is distinguished by the outstanding performances of its students whether academically by attaining outstanding results in the General Secondary Certificate Exam (The Tawjihi) or through different extracurricular activities. Mostly, DTA students have won advanced positions in the various competitions they participated in at the level of the city of Jerusalem and the Jerusalem Directorate of Education. Such competitions were in many fields. In addition, the students are always busy in activities and participations supervised by the school itself such as participating in religious and school celebrations, morning school broadcasting, open days, cultural exchange programs, summer camps and art exhibitions.